This one has been around a month or two and I’m just now discovering it. In the background you can see the stack, in the foreground is one module that gets stacked. Once completed, the 64-core version of the Parallella computer would deliver over 90 GFLOPS of performance and would have the the horse power comparable to a theoretical 45 GHz CPU [64 CPU cores * 700MHz] on a board the size of a credit card while consuming only 5 Watts under typical work loads. With multicore cheap risc chips, we’re headed to a whole new level of compute power for not much money. Looks like fun, too. One of the more interesting uses of “clusters” is for security via distribution. There are many ‘distributed file systems’, including one that requires a ‘quorum’ to open it. Developed in Italy, it looks like something the Mafia asked for ;-) Any one person can be compromised (or settable up to several), and divulge their password. Until you get a ‘quorum’ of them, you get nothing… The blocks are spread over many systems all over the place, so take any one system (or several) you get nothing. It is RAID structured, so kill a system (or take it) and it rebuilds the missing parts. I’m sure you can see why this is of benefit. So one of my “someday” projects is to make such a cluster distributed compute and file server. Then spread the parts around via a routing system like Onion and you have a non-stop non-compromise compute and file system. Only question / issue is performance level over multi-hop routes… (One could use VPN instead at the risk of contact tracing). University of Southampton, SO17 1BJ, UK. My advice is to to check the downloads page on raspberrypi.org and use the latest version. 9. Just doing this out of habit, but note not doing any more than just getting the list (upgrade is via “sudo apt-get upgrade”). 10. Get Fortran… after all what is scientific programming without Fortran being a possibility? and get the latest installer’s Guide. We are going to follow the steps from 2.2 (from the Quick Start Section) in the guide. 14. Get MPI sources from Argonne. Celebrate if you get this far. 29. We now have a master copy of the main node of the machine with all of the installed files for MPI in a single place. We now want to clone this card. You will use the “Write” option to put the image from the disk to your card and choose the “2012-08-16-wheezy-raspbian_backup_mpi_master.img” image you just created. 32. Put the card into your second Pi and boot this. You should now have two Raspberry Pis on. Unless otherwise stated, all the commands below are typed from the Master Pi that you built first. Enter a passphrase e.g. “myfirstpicluster”. If you leave this blank (not such good security) then no further typing of passphrases is needed. 36. Now to run a little C code again. In the examples subdirectory of where you built MPI is the famous CPI example. First time you will need to enter the passphrase for the key you generated above (unless you left it blank) and also the password for the second Pi. If you repeat this a second time you won’t need to type any passwords in. Hurray. Note that we have NOT changed the hostnames yet (so yes, the above IS running on the two machines, but they both have the same hostname at the moment). Now you can see each process running on the separate nodes. Thanks to all of the authors of the posts linked to in this guide and Nico Maas. Thanks to the team in the lab: Richard Boardman, Steven Johnston, Gereon Kaiping, Neil O’Brien, and Mark Scott. Also to Oz Parchment and Andy Everett (iSolutions). Thanks to Pavittar Bassi in Finance, who made all the orders for equipment happen so efficiently. And, of course, Professor Cox’s son James who provided specialist support on Lego and system testing. There are various Python bindings for MPI. This guide just aims to show how to get ONE of them working. Hello, World! I am process 0 of 2 on raspberrypi. Hello, World! I am process 1 of 2 on iridispi002. Hello, World! I am process 2 of 4 on raspberrypi. Hello, World! I am process 3 of 4 on iridispi002. Hello, World! I am process 1 of 4 on iridispi002. Hello, World! I am process 0 of 4 on raspberrypi. 2. A prerequisite for pip is “distribute” so let’s get that first and then install pip. The sudo is because the installation of these has to run as root. MPI libraries can also be built “shared” so that they can be dynamically loaded. This gives a library file that ends in “.so” etc. not “.a” and we can do that by building those MPI libraries again. This is a repeat of steps above, but written out again using the suffix “_shared” on the directory names. 2. Get MPI sources from Argonne. 4. Make yourself a place to put the compiled stuff – this will also make it easier to figure out what you have put in new on your system. This entry was posted in Tech Bits and tagged Cluster, FORTRAN, Lego, Pi, Python, Raspberry Pi, Supercomputer. Bookmark the permalink. I had read about the Pi computer, but not the lego one! Damn! I am going to have to talk to Network world about keeping up! I love legos and computers – so needless to say, that is my all time favorite computer picture. You ought to look at their HTML “update” link as it has a half dozen pictures, including the “lego in progress” steps. @E.M. – Of course! also attach wheels to fans. The possibilities are endless! And part of the reason I love Legos! A Pi cluster running Mosix might be fun. What Mosix does is assigns various processes to other nodes in the cluster and keeps track of them. Say, for example, you want to start Apache and have it configured for 10,000 child processes. Mosix will begin to farm out the children to various nodes and keep track of the load on those nodes and constantly shift processes around in order to keep the CPU load balanced on the various nodes of the cluster. With something like the Pi, it becomes nearly an infinitely scalable processor that depends really only on the bandwidth interconnecting the nodes. Unlike “load balancing”, Mosix turns the processors into one huge meta processor. I love the idea and it’s a great student project. However, I can’t justify spending over $4,000 to create a cluster with (optimistically) about 1/4 the double-precision FLOPs of either the latest Intel Xeon “Phi” or NVidia’s “Tesla” GPU coprocessor boards. Both of these solutions are pushing 1 TFLOP of true double-precision calcualations for between $2,800 to $3,500. 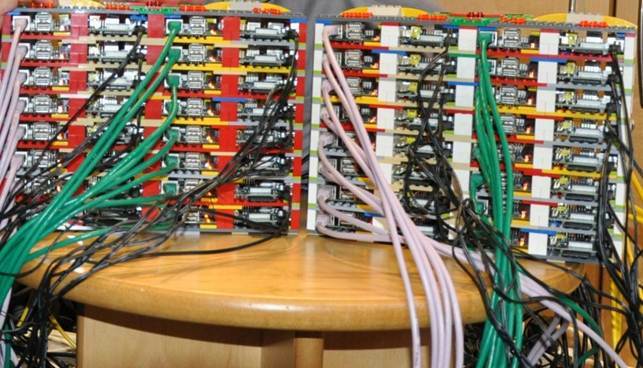 That’s pretty incredible power packed into a full-length, 16-channel PCIe 3.0 card. Using said toolchain, people have created a version of the Unreal FPS engine and other demos to run in the browser. Graphics output is done via HTML5 / WEBGL which is supported by Firefox. LLVM is a very modern compiler backend; I don’t know if they already support Raspberry’s or Parallela’s but I would look out for that. The old GCC backend is a PITA; LLVM was originally written to replace it and has due to apple’s support gained an even bigger role in the iOS/IPhone space. Many language- and platform-transgressing possibilities there. If you are looking for an awesome and fairly easy to master language, try “go” from Google. Hehe, when I saw the headline I immediately knew you were talking about the University of Southampton computer, which as you say has been on the RasPi site a couple of months. So I thought I would add something new by linking to the Parallela board, but you got there before me on that too:-). At the moment, there seems to be a holy war going on between the chip manufacturers, so we’re going to see more improvements going forward in this arena. ARM have the A15 4 core chip out with an A50 series of chips using 16nm tech on the way at a price point around $20-30. Only last year I built myself a “supercomputer” (I use the word liberally here) with two dual graphics cards and 32GB Ram plus SSD (15 second bootup time), and already it is made obselete by the things that are coming out now. Yes there’s always a race between a load of cheap parts and one big expensive part. Who wins keeps changing. See that multicore chip at the end of the article. I think it’s the lowest cost / most bang! I keep wanting to make a Mosix system “go” and then never get around to it… Sigh. Thanks, Paul; I didn’t know Cython, will look into it. Me too, I guess we both want to get things done. The tools I mentioned are the panzers of the language war. Help you to occupy the territory of the other language or platform fast without needing to actually speak it. search terms to use: transpiler , source-to-source-compiler.